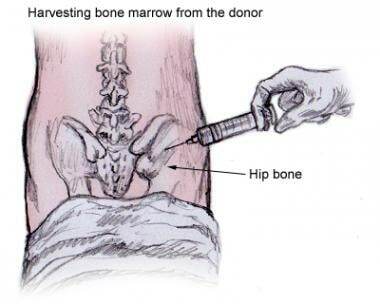 An image depicting bone marrow donor typing procedures can be seen below. 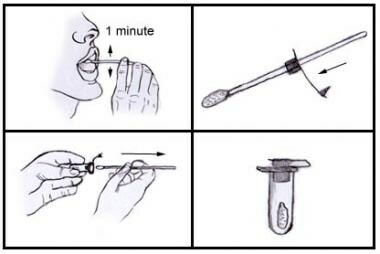 A buccal swab can be used for human leukocyte antigen (HLA) typing of bone marrow donors. Buccal swabs are typically obtained at the time of bone marrow registry enrollment for all potential donors. Pilot studies of autologous stem cell transplantation using peripheral blood have demonstrated rapid engraftment with this technique. With the infusion of 5 million CD34+ cells, the recovery time for platelets to a target of 20,000/μL is possible within 2 weeks. The incidence of acute graft-versus-host disease (GVHD) is similar with the two methods. However, because of higher number of T cells infused in cases of peripheral blood as a source, the incidence of chronic GVHD is higher. Overall survival and disease-free survival are slightly better in cases of peripheral blood. Most bone marrow donor procedures are performed under general anesthesia. Although local anesthesia can be used, the use of lidocaine at multiple puncture sites may pose serious cardiovascular risks. Spinal or epidural anesthesia is another option but may not provide adequate analgesia in most cases. Accordingly, all donors should be evaluated for the possibility of general anesthesia during the donation process. This should include inquiry about neck pain or any other cervical spine problems. Patients with cardiovascular or pulmonary problems require complete evaluation by an anesthesiologist before the procedure. The procedure is performed with the patient in lateral or prone position. The posterior iliac spine is the preferred site for the collection (see the image below). Other possible sites include the anterior iliac spine and the sternum, but the proximity to vital structures necessitates extreme caution during the procedure. Bone marrow stem cells are aspirated from the posterior superior iliac spine. After administration of appropriate anesthesia, the site is marked. Using a large-bore needle, marrow is drawn into syringes. The procedure has to be repeated on multiple sites, so careful spacing of the puncture sites is required. The usual volume required is 10-15 mL/kg of the recipient’s weight, which equates to less than 1000 mL in the case of an average-weight person. In cases of an autologous transplant patient previously treated with chemotherapy, a larger quantity of marrow is needed. Most potential complications are related to anesthesia risks. Spinal or epidural anesthesia may result in loss of vascular tone in the lower extremities, which may exacerbate hypotension during collection. The possibility of hemorrhage or infection at the puncture sites exists. Most donors need volume resuscitation during the procedure in the form of colloids or blood. The need for homologous blood products can be avoided by the use of preharvest blood storage. With the recognition that blood stem cells circulate in the peripheral blood, methods have been developed to collect and harvest them from the peripheral circulation. The use of granulocyte macrophage colony-stimulating factor (GM-CSF)/granulocyte colony-stimulating factor (G-CSF) and rapid assessment of the quality of the specimen have facilitated the use of peripheral blood stem cells (PBSCs) as the preferred method. Also, it has the advantage of rapid engraftment of stem cells in the recipient. G-CSF is the most common cytokine used for the mobilization of stem cells. The recommended dosage is 10 µg/kg of body weight per day. After the administration of G-CSF, the number of stem cells in peripheral circulation increases, reaching a maximum at day 5. Although the total white blood cell (WBC) count continues to increase even after day 5, the CD34+ cells yield becomes progressively lower. A minimum of 2 × 106 CD34+ cells/kg of recipient’s body weight is considered an acceptable dose for infusion. The recovery of platelets is affected the most with doses lower than that. The CD34+ cell content is measured by fluorescent activated cell-sorting. Mobilization with G-CSF alone is usually sufficient to achieve sufficient CD34+ cell content. Exceptions are the patients treated previously with chemotherapy or radiation therapy who are going for autologous stem cell transplantation. In those cases, a second agent is required, like AMD3100, in addition to G-CSF for preparation. Apheresis requires establishment of good venous access. Many people require a central venous catheter if no large peripheral veins can be found. The typical triple-lumen catheters are not suitable for apheresis, because of their smaller lumen size. The catheters appropriate for apheresis are similar to the dialysis catheters that are designed to prevent collapse and local recirculation of the blood. Citrate is added to prevent clumping of the cells in the extracorporeal circuit. It binds calcium ions and may manifest with signs of hypocalcemia during the procedure. The patient should be watched for symptoms such as perioral numbness and paresthesias, and the procedure should be stopped until the resolution of symptoms. Slowing of the blood flow rate through the machine also decreases the risk of citrate toxicity. The benefit of oral or IV calcium supplementation is unclear. Large-volume leukapheresis involves the processing of more than two to three times the patient’s blood volume and is used for donors with lower CD34+ blood levels or for donors who need the procedure to be completed within a limited number of sessions. Processing of larger volumes poses greater risks of citrate toxicity and thrombocytopenia. The platelet count may continue to decrease for several days even after the procedure. Exacerbation of autoimmune diseases has also been observed after the drug. Other serious but rare complications include splenic rupture, myocardial infarction, and ophthalmic complications. Juric MK, Ghimire S, Ogonek J, Weissinger EM, Holler E, van Rood JJ, et al. Milestones of Hematopoietic Stem Cell Transplantation - From First Human Studies to Current Developments. Front Immunol. 2016. 7:470. [Medline]. Collins RH Jr, Shpilberg O, Drobyski WR, Porter DL, Giralt S, Champlin R. Donor leukocyte infusions in 140 patients with relapsed malignancy after allogeneic bone marrow transplantation. J Clin Oncol. 1997 Feb. 15(2):433-44. [Medline]. Bensinger WI, Martin PJ, Storer B, Clift R, Forman SJ, Negrin R, et al. Transplantation of bone marrow as compared with peripheral-blood cells from HLA-identical relatives in patients with hematologic cancers. N Engl J Med. 2001 Jan 18. 344(3):175-81. [Medline]. Punzel M, Kozlova A, Quade A, Schmidt AH, Smith R. Evolution of MNC and lymphocyte collection settings employing different Spectra Optia® Leukapheresis systems. Vox Sang. 2017 Aug. 112 (6):586-594. [Medline]. Riezzo I, Pascale N, La Russa R, Liso A, Salerno M, Turillazzi E. Donor Selection for Allogenic Hemopoietic Stem Cell Transplantation: Clinical and Ethical Considerations. Stem Cells Int. 2017. 2017:5250790. [Medline]. Fürst D, Niederwieser D, Bunjes D, Wagner EM, Gramatzki M, Wulf G, et al. Increased age-associated mortality risk in HLA-mismatched hematopoietic stem cell transplantation. Haematologica. 2017 Apr. 102 (4):796-803. [Medline]. Stroncek DF, Holland PV, Bartch G, Bixby T, Simmons RG, Antin JH. Experiences of the first 493 unrelated marrow donors in the National Marrow Donor Program. Blood. 1993 Apr 1. 81(7):1940-6. [Medline]. Adhikari J, Sharma P, Bhatt VR. Optimal graft source for allogeneic hematopoietic stem cell transplant: bone marrow or peripheral blood?. Future Oncol. 2016 Aug. 12 (15):1823-32. [Medline]. Pulsipher MA, Chitphakdithai P, Logan BR, Leitman SF, Anderlini P, Klein JP, et al. Donor, recipient, and transplant characteristics as risk factors after unrelated donor PBSC transplantation: beneficial effects of higher CD34+ cell dose. Blood. 2009 Sep 24. 114(13):2606-16. [Medline]. [Full Text]. Confer DL, Miller JP. Long-term safety of filgrastim (rhG-CSF) administration. Br J Haematol. 2007 Apr. 137(1):77-8; author reply 79-80. [Medline]. [Full Text].